After steady improvement in his first games in charge Paul Heckingbottom saw one giant step backwards in a 3-0 defeat at Middlesbrough and it does not get any easier with the Sky Bet Championship leaders next up for Leeds United. 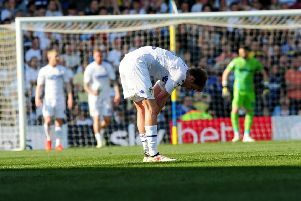 Having slipped down to 12th place in the table, the Whites are desperate for three points when they host long-time frontrunners Wolves at Elland Road tonight – and the statistics are certainly against them. Leeds have failed to beat any team currently in the top five all season and have only managed two wins against any of the top nine, never mind the fact they are now playing the team commonly accepted as the best in the division. The previous meeting with Wolves this season does not bring more hope as the Midlands side ran out convincing 4-1 winners at Molineux. Since then they have gone on to dominate the Championship and stand six points clear and 10 points ahead of third-placed Aston Villa. They have failed to win any of their last three matches, however, so have shown a few signs of vulnerability that were not there previously. But United’s run trumps that as they have still only won one of their last 12 matches. Their play-off hopes are obviously hanging by a thread and they cannot afford many more slip-ups if they are to make up the eight-point gap they currently have behind sixth-placed team Bristol City. But despite this head coach Heckingbottom believes playing high flyers Wolves next is good for his team following their awful performance at Middlesbrough. He said: “It’s probably the perfect game. All eyes will be on Heckingbottom’s team selection as he faces a number of dilemmas, not least who plays in goal. Heckingbottom admitted he was looking into the goalkeeping position, but said Wiedwald‘s place was not the only one under examination with other areas also to improve. The head coach has plenty of other decisions to make with none of the players on show at the Riverside Stadium covering themselves in glory. Heckingbottom had gone with the same 11 that battled to a 1-0 win over Brentford the previous week, but it is unlikely he will do the same against Wolves. Eunan O’Kane and Kalvin Phillips struggled in midfield and both were substituted with Adam Forshaw and Ronaldo Vieira looking more likely to be the chosen ones tonight. Makeshift full-back Vurnon Anita had a nightmare up against raiding winger Adama Traore and the rest of the back four also looked disorganised at times. Matthew Pennington is still in reserve along with left-back Laurens De Bock, but they have also struggled in recent weeks. Heckingbottom could turn to youth with Tyler Denton and Tom Pearce among the youngsters pushing for a place. There was some good news this week with Pablo Hernandez back in training after a groin strain and he is likely to come back into the team after missing the last two games,. But Kemar Roofe is still out following his muscle strain, along with longer term absentees Conor Shaughnessy, Luke Ayling and Tyler Roberts. Wolves will be without key midfielder Ruben Neves, who is suspended.